Punta Arenas is the regional capital of Magallanes and Chilean Antarctic Territory. It is situated on the continental shore of the Strait of Magellan, 90 kilometers from Cape Froward, southernmost point of Continental America. Although Patagonia, for being a binational region as such has no a capital city, for its strategic and historical importance Punta Arenas is also known "the capital of Patagonia". According to the 2014 census, the population was of 123,401 inhabitants, the distance in a straight line with the capital Santiago is of 2,197.39 km., and the route distance is just over 3,400 km. The city was founded in 1848 and its first settlers came from the island of Chiloe in southern Chile, since then, this migratory flow has been constant. But there is also a strong influence of European settlers, who together with the Chileans populated this part of the country in the early twentieth century. Croatian immigration played a crucial role in the development of the region of Magallanes and the city in particular. Also one can see the mark left by hundreds of English settlers, Germans, Italians, Swiss, Spanish, Portuguese, French, etc. The name of many geographical locations in the region, are a clear expression of how hard was for the first explorers and inhabitants their life in Punta Arenas and surroundings. As an example we can find places like Puerto del Hambre (Port Famine), Paso Tortuoso (Tortuous Pass), Golfo de Penas (Gulf of Surrows), Cape Froward, Ultima Esperanza (Las Hope Province), Seno Obstruction (Obstruction Inlet), Bahia Inutil (Useless Bay), etc. 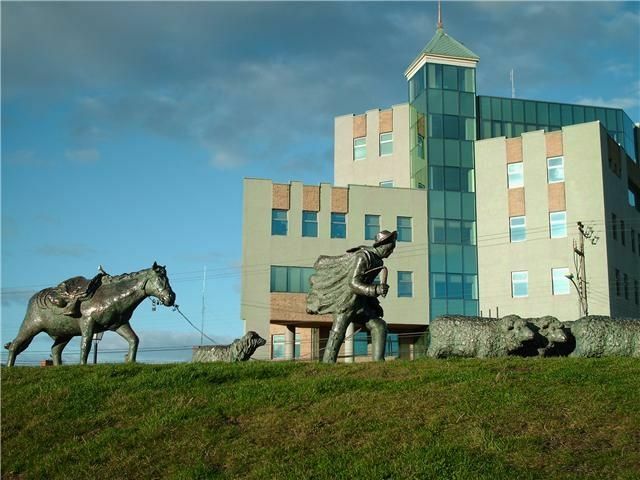 Through its history, Punta Arenas and the region in general, have had periods of economic boom such as the Gold Rush of the nineteenth century, the rise of cattle ranching, the time of Black Gold (crude oil), the period of the Free Port, the creation of the Duty- Free Zone, and it can also be mentioned the good moment that tourism is experiencing right now. Winter temperatures are generally low, the average does not exceed 3 °. C, with a low that sometimes can be less than -10 °C. In summer (December-February) the medium temperature exceeds 10 ° C., with exceptions of 24-25 ° C. The wind that until recently was typical of the Spring-Summer season, can now appear at any time of the year, easily reaching 100 km / hour. 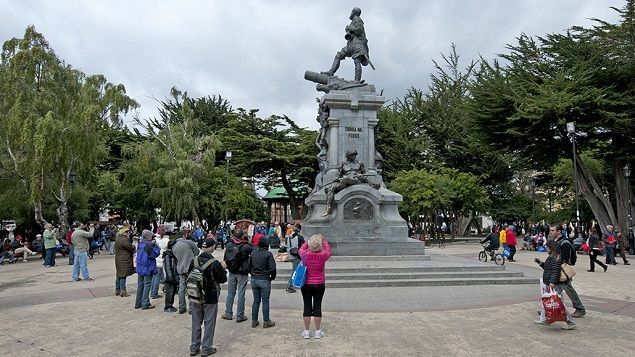 (Punta Arenas' Main Square), marks the most central point of the city, in the center of the square stands the monument in honor of the discoverer of the Strait, the Portuguese explorer Ferdinand Magellan, which was donated by the wealthy businessman Jose Menendez, on the occasion of the fourth centenary of the discovery of the Strait of Magellan. The monument also highlights a Tehuelche Indian, an old tradition says that if the toe of the Tehuelche is kissed by the visitor, he will surely return to Punta Arenas, The square is named after the governor Benjamín Muñoz Gamero, who found tragic death in the bloody mutiny led by Lieutenant José Miguel Cambiazo in 1851. Surrounded by well-maintained historic buildings, that reflect the origin of the city as the economic capital of southern Patagonia to the present day. Address: 336 Bulnes Av., adjacent to "Maria Auxiliadora Don Bosco" Catholic temple, created by the Salesian priest Father Maggiorino Borgatello in 1893. Through its halls, a journey of more than 100 years of history of southern Patagonia, within its theme, the most comprehensive museum of Chile. The display consists of an interesting exhibition of what were the religious Missions in Patagonia, paleontology, ethnography, flora and stuffed animals, the Antarctic Territory, regional Oil Industry, etc. Address: 949 Magallanes St., at Braun- Menendez Palace, just half block away from the Main Square, built in 1903 and recently renovated, this mansion was built entirely with materials, furniture and decorative objects brought from Europe. In 1974 the luxurious palace was declared a National Historic Monument, in 1983 the heirs of the Braun Menendez family decided to donate the property to the Chilean state in exchange for its restoration and maintenance, then the collections exhibited in the Museum of Patagonia were moved here. Today the museum includes archaeological, ethnographic, photographic and art collections covering from the first geographical discoveries until the mid-twentieth century. (Museum of Memories), belonging to the Instituto de la Patagonia. Address: 01890 Bulnes Av., just across the Duty Free facilities. This outdoor museum, receives a large number of national and foreign visitors, especially in Spring, Summer and Autumn seasons. It has 8 wooden heritage buildings, 40 old transport vehicles, machinery and countless tools, associated mainly to the work of livestock as well the replica of an oil derrick of early last century, with a height of 16 meters, built with lenga wood and steel, all the collection of immense historical value for the region. Officially "Sara Braun" Municipal Cemetery. In 2013, this graveyard was ranked sixth by CNN among the most beautiful in the World and most recently, the 2015, in first place by the newspaper "La Opinion" of Murcia, Spain. Located on Avenida Bulnes near Punta Arenas downtown, created in 1894 and National Monument since 2012. Its entrance is a monumental portico, donated by businesswoman lady Sara Braun, in 1919. It draws the attention the layout, of cypress-lined small avenues, monuments, chapels and mausoleums with marble and fine finishes, most of them belonging to pioneer families and institutions. In rare occasions a cemetery becomes a tourist attraction but this graveyard possesses a singular and strange beauty that has crossed the borders, becoming an obliged visit for tourists and pride of the city. It is included in most of the tourist circuits through the city. It is said that in non-traditional hours (Sunday morning for example) is hard to find a restaurant or cafe open in Punta Arenas, but if you ask me if there are any, yes, there are several and very cozy. In Bories, the main downtown street you can find several pizzerias and restaurants, the same happens at the Free Zone and Mall Espacio Urbano, shopping centers that feature large Food Courts. Other areas of the city also offer good food services, however where the gastronomic offer is diverse and varied is along O'Higgins Street, next to the Hotel- Casino Dreams. Here are many places that do not have a great infrastructure but are highly specialized in its field. For its part, Dreams Hotel with its Casino and Restaurants have strengthened greatly tourist services in Punta Arenas. 2 blocks further South of the Casino, is located the Municipal Market, a place where you can buy mostly seafood, there are also stalls selling handicrafts, but one of the things that most attracts tourists are the "cocinerías", small but neat eateries or restaurants where you can taste a variety of seafood and typical Chilean cuisine. These cocinerias are located on the second floor. 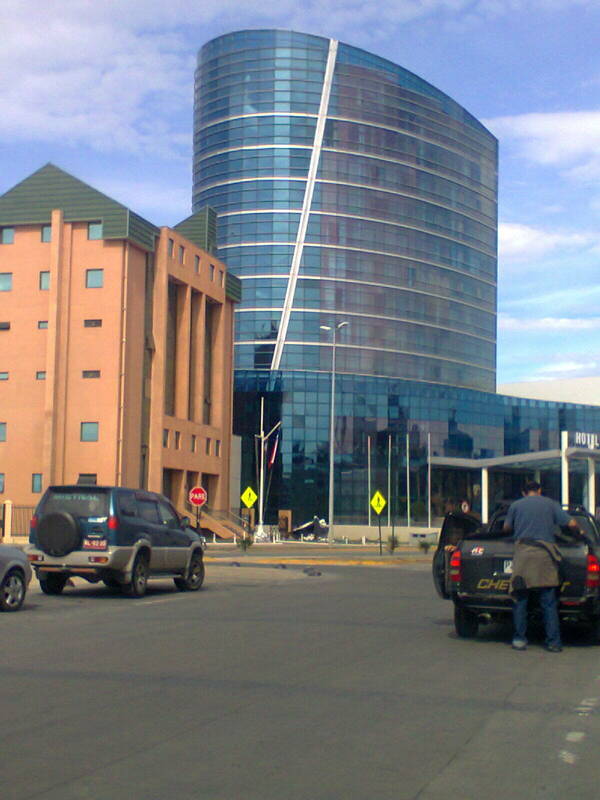 On the third one, there is a food court with panoramic views of the Strait of Magellan. Another place visited by locals and tourists is the "Kiosco Roca", located precisely on Roca street. This very little restaurant was chosen as "La mejor picada de Chile" ("picada"= Chilean idiom meaning "place little known but highly recommendable"). Here you can order the specialty of the house: the "Choripan", a sandwich that consists of a strange combination of ground chorizo with mayonnaise which is recommended be accompanied with a glass of milk and banana. Cheap, tasty and it will not upset your stomach. If you visit Kiosco Roca, try to avoid peak hours, as it is generally crowded. Located on the shores of the Strait of Magellan, 7.5 km north of Punta Arenas. This museum opened in October 2011 owes its name to the main replica displayed in full size of the Spanish carrack "Nao Victoria", which commanded by the Portuguese navigator Ferdinand Magellan made the largest maritime achievement of that time, the first World circumnavigation, between 1519 and 1522. Also you can see reproductions of other major ships that marked a milestone in the regional and national history as the "Goleta Ancud", schooner which was sent to take possession of the Strait of Magellan on behalf of the Chilean Government and brought the first immigrants at the beginning of the regional colonization in 1843; the "James Caird", a lifeboat that played a big role in the rescue of the crew of the "Endurance", ship belonging to Ernest Shackleton's Polar Expedition that had capsized in the Antartic. The original James Caird was taken from South Georgia Islands to England and now is on permanent display at Dulwich College, the old college of Shackleton. You can also visit the replica of the "HMS Beagle", a brig of the British Navy of 1820, which later became an exploration vessel, and made three trips, the most famous is the second one (1831- 1836), under the command of Captain Fitz Roy, with the young naturalist Charles Darwin on board, and when the Beagle stayed in the region for nearly three years. Monument to the Shepherd at Bulnes Av., Punta Arenas. Located on the median strip of Bulnes Av., just opposite the Hospital de las Fuerzas Armadas. The "Monumento al Ovejero" consists of 12 full-scale figures made in bronze, 10 sheep, a horse and the shepherd. It is inspired by a real farmworker of the first half of the twentieth century. The first version of the sculpture was inaugurated in 1944 and the current representation dates back to 1963. The figure is representative of the most traditional economic activity within the regional history. Situated 62 km. South of Punta Arenas, Fuerte Bulnes was a Military Fort founded in 1843 at the beginning of the colonization of Patagonia. For the centenary of its foundation, in 1943, it was restored and reinaugurated as a museum. The installation of the Fort was of great significance for the sovereignty of Chile on the Strait of Magellan as it is said that the next day that the first settlers arrived to what would be Fuerte Bulnes, the French boat Le Phaeton, with similar purpose for France, reached the place. Because of the inhospitable climate, it was not possible to establish a large and stable population, so in 1848 the little village moved further north, with better conditions and where the current city of Punta Arenas was founded. Located 2 km. away from Fuerte Bulnes, on the coast of Bahia Buena, are the remains of what was "Ciudad del Rey Don Felipe", settlement founded in March 1584, first and failed Spanish attempt to populate these southern lands. Because of the hostile climate and tremendous isolation of the place, the almost complete population of the village of 337 people, died of starvation. When the English privateer Thomas Cavendish arrived at the place in 1587, found only the remains of the unlucky colony and just one survivor, faced with such a grim scene Cavendish renamed the place as "Port Famine". The last survivor was found and picked up in early 1590 by the British ship The Delight. During the Spring- Summer months (October to March), there are many tours departing from Punta Arenas to visit the "pinguineras" (Penguin Colonies) of Isla Magdalena and Seno Otway. Magdalena Island is 35 km away from the city, officially named "Monumento Natural Los Pinguinos", being the largest Magellanic Penguin colony in Chile, gathering some 200,000 specimens. The duration of the tour is about 6 hours (round trip) and on the way you can see a variety of marine fauna such as Toninas Overas (Commerson's Dolphin), Sea Lions, birds such as the Imperial Cormorant. Seno Otway Penguin Colony, much smaller than Isla Magdalena, is located 65 km. North of Punta Arenas, overland tour that lasts about 5 hours. In this Nature Reserve gather around 6000-8000 specimens of Magellanic Penguin (Spheniscus magellanicus ) to nest and feed their young between the months of October to March. 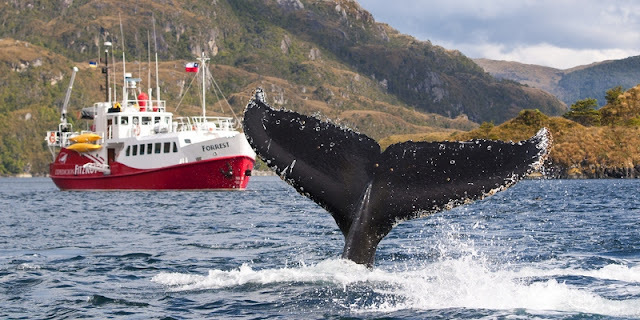 Local tourist agencies offer sea travels to visit and discover many places of great interest, either in the Strait of Magellan or the countless channels and fjords of the region. One of these can be performed with M/V Forrest Cruise Expeditions. There are several options to take, the main ones being the expedition in search of the presence of Humpback Whales in the vicinity of Carlos III Island; the visit to places of extraordinary and little known beauty such as the Glaciers of D' Agostini Sound in Tierra del Fuego Island, Almirantazgo Sound on the West coast of Tierra del Fuego or the corners of Skyring, beautiful inlet of southern Patagonia, almost unexplored. This Andean Club (although not precisely in the Andes) is located 8 km. West of the city, nestled on the slopes of Mount Fenton, better known as Cerro Mirador. It has a total area of 209 hectares, of which approximately 18 correspond to the ski tracks. Its highest point is 600 mts., from where you have a fantastic view of the Strait of Magellan and Tierra del Fuego (Land of Fire Island). The facilities are located within the Reserva Forestal Magallanes (Magallanes Forest Reserve), also known as Parque Japones. There are 11 ski slopes to enjoy the excellent snow quality, depending on the conditions of each year, the best time should be July and August. In the Spring- Summer season, visitors can enjoy chairlift rides, activity that often also enjoy hundreds of tourists from around the world when their ships are docked at the port of Punta Arenas, visitors can also take walks through the innumerable paths that cross the forests of the Reserva Forestal Magallanes, which have a varied flora and many bird species, practicing Canopy, Trekking, Mountain Biking, etc.